Sarah Francisco was born Sarah Wearing in Ireland around 1839. She was the daughter of a blacksmith. Her mother died when Sarah was five and she was sent to live with an aunt on a dairy farm. A potato disease devastated Ireland in the decade from 1845. The resulting famine caused over two million people to emigrate and seek a better life. Many young women, including Sarah’s elder sister, left Ireland and migrated to Australia. Sarah followed her sister and arrived in Port Adelaide aboard the Peerless on 7 November 1866. A year later Sarah married John ‘Frank’ Francisco, a seaman from Genoa, at St Patrick’s Church in Grote Street, Adelaide. Sadly the marriage was an extremely unhappy one. Francisco went on heavy drinking bouts and was continually violent towards Sarah. He once tried to throw her down a well and several times attempted to poison her. On one occasion he hit her in the face with a brass candlestick - Sarah carried the scar across her mouth for the rest of her life. Frank usually spent the days fishing or just loafing around. One day he came home complaining of a pain in his ankle. He went to bed and stayed there for the next three years. Doctors recommended a change and suggested a two week break away from home could benefit his condition. Frank left but didn’t return. Sarah never saw him again. The marriage however did produce two sons, Joseph and John. Sarah was passionately fond of her boys and the task of providing and caring for them fell solely to her. She would set off at 3 am with one child in her arms and the other on her back, working until 11 pm cleaning hotels or taking any job that would keep the three of them fed and clothed. Sarah was busily working one day when Joseph rushed in breathlessly telling her that Johnny had fallen down a cutting where they were playing. Sarah rushed to the site and called a doctor but the boy was only able to whisper a few words before he died in his mother’s arms. It was grief and sorrow over the loss of her five year old son that began Sarah’s downward spiral into drunkenness. In 1895 Sarah’s name appeared in the press during a coroner’s inquest. She had assisted a young fellow hotel worker, Alice Burgess, when her newborn baby died. In stark contrast to how she was generally described, the coroner depicted Sarah as thoughtful, reliable and responsible. Unfortunately, this lapse in Sarah’s customary behaviour didn’t last too long and she soon returned to her old ways of drinking to excess. The Salvation Army began its mission in Australia at an open air meeting organised by John Gore and Edward Saunders in the Adelaide Botanic Gardens on 5 September 1880. The first officers arrived in February 1881. 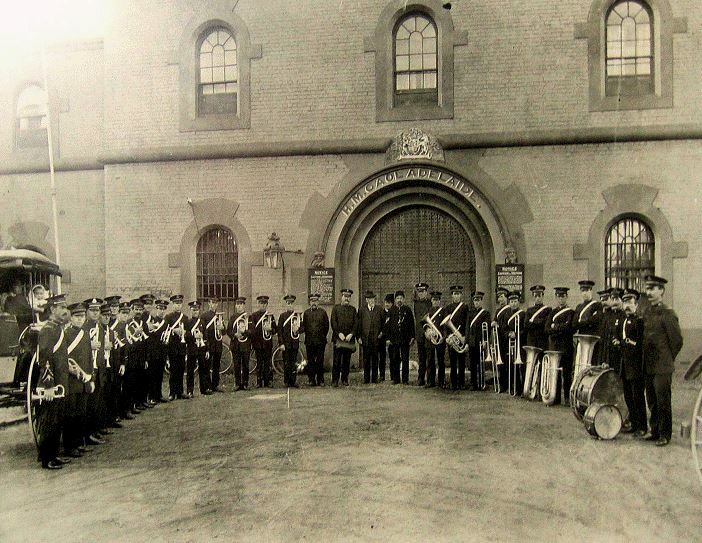 A Salvation Army corps in Port Adelaide was established late in 1882 where Army members attended hearings at the police court. The magistrate would permit some of those sentenced to go to the Salvation Army Home instead of prison, if they agreed. Around 1894 a young Salvationist, Susan Morris, spent time with Sarah Francisco in her cell at the Port Adelaide lock-up trying to get Sarah to consent to such an arrangement. Sarah steadfastly refused to be part of it. Following her marriage to William Roberts in 1903, Susan Morris became Sergeant-Major Mrs Roberts. While selling the 'War Cry' around the streets and hotels in Port Adelaide she often met up with Sarah Francisco and had a chat. Sarah’s familiar lifestyle continued until 15 April 1912 when she suddenly consented to accept the offer of the Salvation Army Home instead of 3 months in gaol. The magistrate and court staff had the unique experience of hearing Sarah plead “Guilty” for the first time. Sarah kept her promise and stayed at the Home. She later moved into a small room at the rear of the Roberts’ house in Queenstown. Sarah did have some relapses and returned to her room ‘worse for wear’ but she was never arrested again. By now, she was into her seventies and using a stick because of rheumatism but she enthusiastically supported the Self-Denial Appeal. At Sarah’s insistence the Roberts took her to all her familiar hotels where she demanded a contribution for the work of the Salvation Army. Not one publican refused. Sarah also asked to call at the Adelaide Gaol before returning home. The head warder came out and had a friendly word before adding his donation. Sarah thanked him and told him she wouldn’t be returning and that he could let ‘her cell’ to another occupant. Sarah’s health deteriorated as the months passed by. Her devotion and prayers became stronger but her health continued to decline. Sarah became weaker and finally slipped into unconsciousness before her ‘promotion to glory’. "FRANCISCO – On November 2, 1916, at the Salvation Army Home, Gilbert Street, Adelaide, Sarah, the beloved friend of Mr. and Mrs. W. Roberts, Queenstown, aged 77 years. A patient sufferer at rest." In 1907 Sarah had forced a promise of a free burial from an undertaker. He kept his promise and Sarah was laid to rest at Cheltenham Cemetery. Many people attended the funeral and the Salvation Army band played in affectionate remembrance of the notorious Sarah Francisco who held a record 295 convictions but whose life and soul had been transformed by the power of God.